In which we slam open the doors to the new home page, the new forums, invite new community participants, talk about webdesign, marketing and icon work but focus our attention on Plasma NEXT and the themes and ideas behind it. Its been one hectic week! Our webdesign crew have worked their little fingers to the bone collecting assets and content, trying to marry webdesign with our ideas for visual design with Plasma NEXT (more on that below) but they pulled it off after a lot of 11th hour panic! Elena, Cuan and David have really gone and been superhuman in their efforts. A special thanks to the Sysadmins in KDE is in order! Please check out our new group page at vdesign.kde.org ! We will try to post assets to it in the future, links and tutorials so keep it handy and bookmark it for future reference. I have too many "huzzah's" and too few exclamation marks in my computer to explain how happy I am with everything so far. But wait, there's more! We've also kicked open the doors to the forums at the KDE-forums where we will not only try to organize our work from now on, not only post ideas and future plans but also invite YOU to comment, contribute and be a part! Post your needs if you're a dev. Post suggestions if you're a designer! Or comment! It's all there! A mighty hearty "thank you" to the admins of the KDE-forums for putting up with us! You guys are fantastic! Beyond that the week has been a hustle and bustle of trying to get a solid set of design ideas going for Plasma NEXT with not only a set theme (presented here and in the forums shortly) but with mood boards, asset-specs and wild ideas! We have a future move into a new icon theme for Plasma that will slowly slowly unveil (you will like it a tad too much). There is also work under way porting a few popular GTK icon themes to KDE (with their designers blessing) so you guys can enjoy all the icon-wonder that exists "on the other side of the fence" while we (sloooowly slooooowly) work and unveil the new icon theme. "But wait!" I hear you say. "You said something about Plasma NEXT and themes and stuff?" you cry. Right, I did... Lets start this off with talking about themes and moods. Themes are relevant because they provide a starting point on which to build further design work. The mood, the sensation you wish to convey with all your work - from marketing to icons, to fonts, to windows, to colors, to layout - everything hinges on your collaborative mood. So what is the mood we're going for with Plasma NEXT in the VDG? A few years back I read Chuck Paluhniuk's "Invisible Monsters" for the first time. In it the characters at one point go up into the Space Needle in Seattle built for the 1962 World Fair - an exhibition about the future seen from the eyes of people in the 60's. Standing at the top the protagonists throw out postcards down to the street below - postcards from the future that never was to the reality that is. One of them writes "When did the future switch from being a promise to being a threat?". For all of us with an interest in art history and scifi you know what it refers to. Around the late 1970's the Future changed into a vision of a dystopia or an apocalypse. Before that, the future was Star Trek, Barbarella, the Jetsons - shining white corridors, a sensation of humanity overcoming all odds with the aid of amazing technology. Free from the bounds of our current reality humanity explored, lived and created. All this with a sincere trust in the wonders of technology and science. 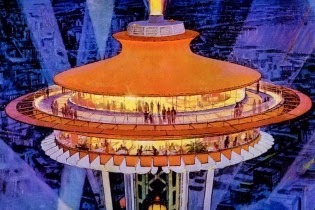 But then the 70's came and things changed from the Seattle World Fairs vision of shining airy rooms and windows looking out over verdant forests into an atomic disaster with raiders battling over gasoline in an ever-reaching desert or an underground dystopia ruled by machines. The theme of Plasma we're going for is the "Future that never was". Based on the technological wonders of KDE, all the brilliant things going on behind a sleek facade, we will try to instill the users (us) with a sense of wonder and optimism for the future, for sci-fi. A trust in technology and breakthroughs for a better tomorrow. Clean, effective but still human and inviting. Brightness, contrast and open air but with rounded shapes intersecting sharp lines and warm, strong spot colors to balance and help bring a human feel to it. Turning back the clock to a time when amazing technology helped us to boldly go where no man had gone before. Next time we'll talk colors of Plasma NEXT, how changes will be handled and go into specifics about icon work.